Have written this one up, being as the first hat I made of this style proved very popular and it's only fair to share. It's construction is a simple one - 7 afghan hexagons slotted and stitched together, with a brim worked in double crochet (English terminology used) The use of 'granny squares' makes it ideal for using up stash oddments and for playing around with colour within the shapes. The only downside I found was all the ends that needed sewing in! Still, it's a great look. 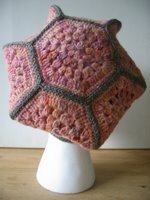 I know granny squares are no original concept or pattern, but I've played around with various combinations of stitches and shapes and how this hat developed is my own design. English terminology is used throughout. I will try to explain the stitches as clearly as I can for beginner hookers like myself, and the US equivalents can be found here and here. Further help with terminology can be found here. Any crochet readers that see mistakes please help me out and post a comment! note:- I have linked up a tutorial to each of these stitches, yet the only ones I could find used US terminology. Please be assured, UK readers, that you will find the right instruction for the stitch! When learning the UK stitches, I used 'Harmony Guide to Crochet Stitches'. Ready? Go on then, make a hex hat! 4th round - 3ch (counts as 1st treble) 1tr into link formed by previous htr, *3tr into next sp (3tr, 1ch, 3tr) into next sp**, 3tr into next space ; repeat from * 4 more times more then from * to ** once more, 1tr into next space and then join to first 3ch with a slip stitch. 6th round - use contrast yarn - 1ch, 1dc into same place then work dc all the way round but work 2dc into each corner chain (the corner chain is between the double clusters) on previous round, join round with a slip stitch to first dc. Weave in ends and give the hexagons a light press with a damp cloth. There a couple of methods for joining. They hex's can either be slip stitched together from the reverse or joined using dc - i.e place hex's together, right sides outwards, and dc into the chains of both hex's at the same time. 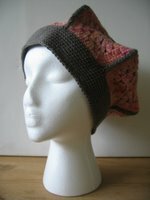 This gives a visible ridge on the outside, which emphasises the shape and helps hold the form if the yarn you are using is soft and drapy. Ideally worked in a contrast yarn. Starting at one of the joins, slip stitch with choice of yarn, dc into same place then continue to work dc into each chain all the way round. Take care to work neatly whenever a seam is met, and work a dc into each side of the seam and into the join chain itself, to ensure the brim is of the right size. If it looks like it may be a little on the small side, work 2dc into the joins. Mark start of round. Do not join the rounds! This brim is worked continuously in dc, round and round. Work until brim is 2" deep. Join round with a slip stitch at starting point. Double crochet can curl slightly and look a little baggy, so for the last round work a decrease every 3 or 4 chains to keep the brim firm. Weave in all ends to finish. A light blocking will be needed, especially if the hexagons weren't pressed before joining. 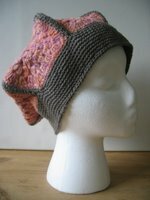 Please, please, please - post a link so I can see your finished hat! And how did I do with the crochet lingo, bearing in mind I'm primarily a knitter? Hate to do this folks, but it's my design and so the rights belong to me. Feel free to use this pattern for your own, private use, but not for commercial reproduction or selling in either written or finished form without prior permission from me, ok? Cool. Let's be friends.